The basal transcription machinery is responsible for the initiation of transcription at core promoters. In Drosophila, basal transcription in testes requires several specialized basal transcription factors. Specifically, a number of TAFs (TATA-box binding protein Associated Factors) have been duplicated and function only in testis. In a paper just published in MBE we, in collaboration with the laboratory of Prof. Margaret Fuller at the Department of Developmental Biology, explored the evolutionary events and forces underlying evolution of Drosophila testis TAFs. We found that all five testis TAFs arose within a relatively short span of ~38 million years approximately 80-100 million years ago by independent duplication events. 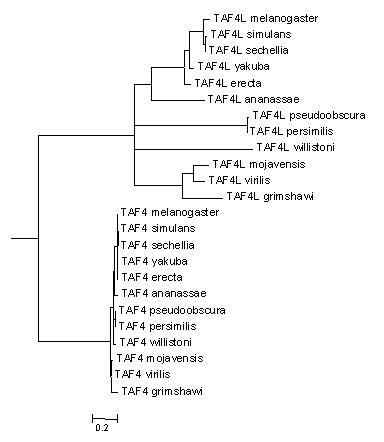 The evolution of testis TAFs has been consistently rapid with further coordinated accelerations in several Drosophila lineages. We found that testis TAFs evolve under sharply reduced purifying selection, pervasive positive selection, and in a tightly coordinated fashion. This study demonstrates that components of the basal transcriptional machinersy can evolve extremely fast and can participate in adaptation.